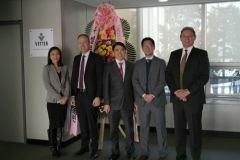 SONGDO and RAVENSBURG, Feb 2, 2018 - (Media OutReach) - In an event at its new branch office attended by key customers and business associates, Vetter's senior management representatives presented the company's service portfolio along with its growth strategy for South Korea and the Asia Pacific (APAC) region. In addition, attendees were introduced to Mr. Michael Yi who will manage the office in his role as Business Development Manager for Vetter Pharma International GmbH, South Korea. Mr. Yi, who is based in Songdo, has pharmaceutical experience in responsible business development roles at several companies. He reports to Ms. Chervee Ho in her role as Director Key Account Management Asia Pacific. "As a leading contract and development manufacturing organization in prefilled drug delivery systems with a vast amount of experience in business development, we are well aware that being physically close to our customers and their ongoing projects is one of the keys to good client relationships," said Vetter Managing Director Peter Soelkner. "Our event today acts as an additional signal of our strategy to build on our local presence and activities in this market," highlights Oskar Gold, Vetter's Senior Vice President Key Account Management, Marketing/Corporate Communications and Customer Project Management. "Vetter's entry into the Korean pharmaceutical market represents an important recognition of the progress our nation has made in this segment," said Javier Camposano, Celltrion's Managing Director for Drug Product. "South Korean companies such as ours are in need of the services Vetter offers, to help us bring our innovative products to local and global markets. With its long history of qualitative resources, combined with its state-of-the art technology, Vetter can support us in competing on a level playing field and achieving our goals on a global scale. We wish Vetter a successful future in Korea." Headquartered in Ravensburg, Germany, Vetter is a global leading contract development and manufacturing organization (CDMO) with production facilities in Germany and the United States. The company has long-term experience offering services ranging from early development support including clinical manufacturing, to commercial supply and various packaging solutions for vials, syringes and cartridges. Vetter's customers range from small and midsize to the world's top 20 pharmaceutical and biotech companies. As a leading solution provider, the CDMO recognizes its responsibility in supporting the needs of its customers in developing devices that contribute to increased patient safety, convenience, and enhanced compliance. Learn more about Vetter at www.vetter-pharma.com.